The soft hues and warmth of a fireplace, create the ideal atmosphere for guests in the lounge room at the Rifflin'Hitch Lodge in Southern Labrador, Canada. Here the guests can enjoy a beverage and/or snack while reminiscing with others about their fishing adventures. The fishing lodge has been created with a soft colored decor of wood walls, ceilings and floors and furnished with matching tables, chairs, pictures and artwork. 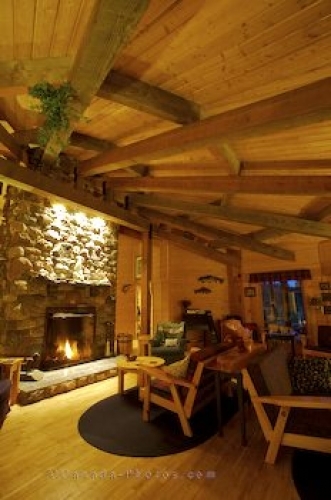 The Rifflin'Hitch Lodge offers guests a first rate experience while spending their vacation at this fishing lodge. Fisherman who come to this wilderness paradise vow to return one day. Picture of room in a fishing lodge, the lounge at the Rifflin'Hitch Lodge in Southern Labrador.